When you research for any fixed base, variable speed routers, it’s no surprise how many kinds are available in the market. But what makes me choose Bosch PR20EVSK Colt Palm Grip 5.6 Amp 1-Horsepower Fixed-Base Variable-Speed Router is because it is convenient to use, lightweight, has variable speed and though small in size, it holds high power with the highest horsepower rating in its class, thus works well for me and for my projects. This review will give you all the details and information you will need about this router, including all its other added useful and reliable features which could also be an ideal choice for you. The solid aluminum base material makes it difficult to see your work. I have been doing a lot of woodworks lately mostly for home use. I never tried speed routers before until it was suggested for specific wood applications that require consistent cuts, which I need to do. And Bosch PR20EVSK Colt Palm Grip 5.6 Amp 1-Horsepower Fixed-Base Variable-Speed Router was a great choice for me among the many fixed routers because, with its variable speed and horsepower, it will allow me different depth adjustments, and can be used in various materials, which I will be using for my project. And with all its added features, it helps increase its performance and productivity. It is also lightweight, thus easy and convenient to use. All these considered I am just glad I chose this one. This fixed speed router can be used both by beginners and experienced wood-maker because it is convenient to use and has the high power and capacity to do both small and even large jobs. With the highest horsepower rank, variable speed of 16,000- 35,000 RPM, professionals would find this reliable to do custom carpentry, trimming, mortising hinges and more. It will allow them adjustment of speed to suit the needs of the job they are working on. Thus the versatility of this speed router makes it handy in different wood applications that require consistency of cuts. It is also ideal for home use because this fixed variable router is very easy to operate with a straightforward depth adjustment and other features that are easy to operate yet at the same time allows them productivity of work. Because the fixed-base router is only used for one fixed location of the base, it is more capable of more precise cuts because they are already set to one specific type. This is especially ideal if you are working on a particular task or project that needs consistent cuts. Fixed based routers are generally small in sizes because of their single and straight forward functionality as compared to the plunge based, hence they are more lightweight. And since they have limited movement, it makes them easy to use and operate as well. Since it is easy to operate, you will have better control of the tool with fixed-base routers. Depth adjustment can be done easily and hassle-free as compare to plunge-based where it tends to be more complicated and requires more steps. This fixed-base variable speed router may be small in size but Bosch PR20EVSK Colt Palm Grip 5.6 Amp 1-Horsepower Fixed-Base Variable-Speed Router holds high power and versatility. It is ideally used for doing custom carpentry, trimming laminate flooring or deck planks, mortising hinges and other wood applications used both professionally and home use. Aside from the 5.6-amp power, 1.0 horsepower and a variable speed between 16,000-35,000 RPM, it comes with added features for improved performance and convenient use. This router provides robust performance with 1.0 horsepower, which is considered to be the highest among the small routers, hence you can be certain in can perform an outstanding job with great results. It is capable of doing a variety of applications and with a variable speed of between 16,000- 35,000 RPM, it will allow you to adjust the speed to match what is required for the job. This model includes “Bosch’s Constant Response” circuitry that is used to monitor the speed for a consistent performance. In this way, you will be able to maintain the right speed for precision all throughout the job. Depth adjustment can be done hassle-free in this fixed router by just aligning and lowering the motor then locking the router in position with the clamp. And with the aid of the wheel on the back of the router base, micro-fine adjustments are also as easy to operate as well. With a variable speed, this router can be adjusted depending on the wood application. The included instructional manual of this router features a chart that shows the speed of each dial position and the list of the routing tasks for each setting to help you match the right speed for the job. This speed router is made of aluminum fixed base that is solid and sturdy but at the same time lightweight for a convenient and easy use. A front spindle lock is designed for the motor to change the wrench easily. A shaft wrench is however included in case you would prefer to use two wrenches. Its speed dial is located on top of the tool body for a convenient access. The motor housing is designed with a palm-shaped, rubber over-molded grip for a stable one-hand operation. The soft startup design reduces startup torque and makes it easy and safe to switch on. Knowing about how the product performs straight from its users is one measurement if the product is effective and good enough to meet the requirements and how it is being advertised. Doing my homework includes going through its customer’s feedback and reviews to distinguish exactly the strengths and weaknesses of this fixed base variable speed router when used. Most of the customers generally agree that the product deserves a five star because it works very well, has plenty of power, easy to set up and lightweight. The variable speed option is particularly helpful as it allows them to adjust it based on the kind of project they are working on. Though one customer mentioned that the case is oversized, it is still a great addition to the package because it is a good protection to the router and makes room for other tools. The case also makes it easy to store and be carried around. The majority has used it to several projects already and it works great without any issues. However, there are few things that need to be improved on. As one customer pointed out the lock can get loose and the router would drop down, thus needs to be constantly tightened. With the router’s big body, it is difficult to hold it even with large hands. Other than that, though small in size, it definitely makes up for power and performance. With the different kinds of these fixed base variable routers available in the market, it is truly hard to find the right one. You may also check these other five options and brief details of each one as it might also fit your standards. This speed routed has a 1.25 horsepower that allows it to have power for even the toughest wood applications. And with a speed range of 16,000 – 27,000 RPM and a variable speed control feature, you will be able to adjust and manage the speed to what suits the project that you are working on. It comes with a dual-LED and clear sub-base for an increased visibility in operation. This compact router is designed with a soft starting motor feature for an easy start-up and reduces the stress of the motor. This motor is capable of an easy transition to fixed and plunge base. Considered to be the quietest and lowest vibration router in class, this Makita model is powered by an 11.0-amp motor and speed between 8,000-24,000 RPM. It comes with a soft start feature for smooth start-ups and comprises of all-ball bearing construction for an extended tool life. It is made to be convenient to use with the rugged aluminum motor housing with small 3 ¼” diameters that it is designed with for easy handling. There is also an industrial cam-lock attached to it for fast and easy depth adjustment and removal of the motor. Other features include the electronic speed control, durable flat top design for stability, a trigger switch with lock-on for continuous operation, and a front adjustable knob that can either be placed in two locations for both left or right-handed users. Hitachi, being known to produce high quality of power tools, designed this speed router with an 11-amp power motor and speed at the range of 8,000-24,000 RPM. Reliable to make smooth cuts in a variety of materials, it maintains a constant RPM even as the load varies, thus you will get precise, controlled cuts in a wide range of materials. It comes with a two-stage motor release clamp for quick and accurate depth adjustments and base changes. The release clamp makes it possible to change from fixed base to plunge base easily and conveniently. The nickel plated motor housing protects the tool from scratches and stains on the tool body. Its handles are wrapped in an elastomer compound for an easy and stronger grip and reduce vibration. It only weighs 7.3 pounds thus, lightweight as compared to other speed routers and operates quietly. With a variable speed control of between 10,000-30,000 RPM, this router can match the speed to the application. By turning the variable speed dial, you will be able to adjust the speed to how you need it for the task at hand. It comes with a smooth rack and pinion fine depth adjustment settings for more accurate settings when used. It is designed with a slim and ergonomically designed body for a more comfortable and convenient use and control. It has a quick release cam lock system for easier depth adjustments and for base removal and installation. Other features include heavy-duty aluminum motor housing, durable flat top design for added convenience when changing bits, and on/off switch button on the front for easy use. With a 1.25 horsepower, this speed router is guaranteed to give you power for the toughest applications and a variable speed control feature for optimal bit speed for each application. It especially has the dual LED and clear sub-base to give you superior visibility in operation. With its soft starting motor settings, it makes startup easy for you. It comes with an adjustment ring that enables controlled bit depth changes to within 1/64-inch. Other features include the large, low-pressure spindle lock button for comfortable, single wrench bit changes, easy motor settings to change quickly between fixed and plunge bases, over-molded rubber handles for a comfortable and secure grip, aluminum motor housing and base construction for long-term durability and a large plunge base platform for added stability for heavier applications. Choosing for the best router is definitely not an easy feat. There are several things you need to consider, which are all essential. To get the best value for your money means picking one that is high in power, speed, performance and output. It should also be easy to operate that even non-professional woodworkers will not have a hard time figuring out how each of its features works. 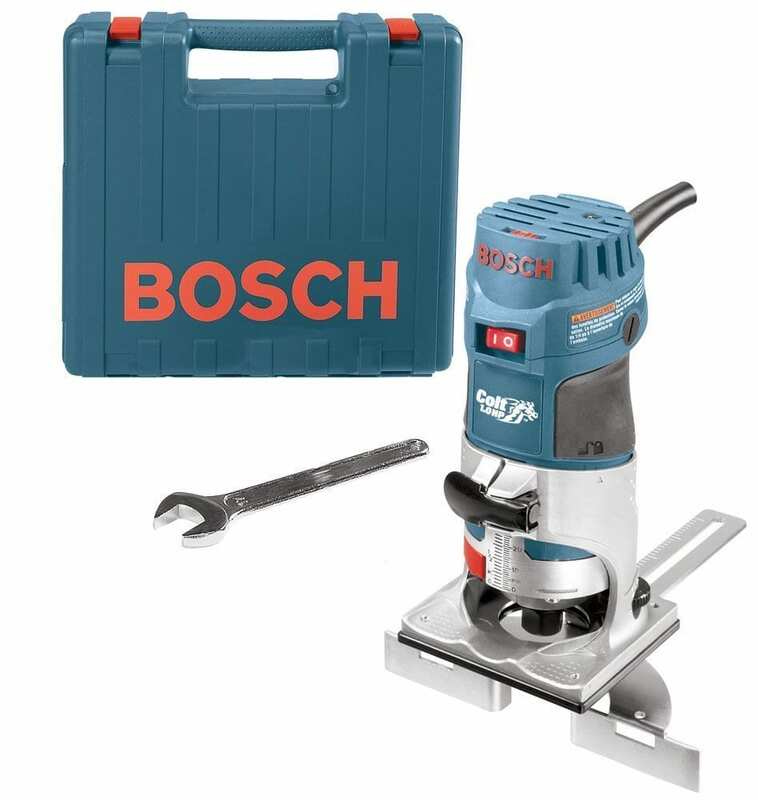 I consider Bosch PR20EVSK Colt Palm Grip 5.6 Amp 1-Horsepower Fixed-Base Variable-Speed Router to be the best option because it has robust power, speed and combined with its other features, it provides you outstanding performance and creates productive accurate outputs. It is even lightweight which makes it even more convenient to use. It is versatile to use in any wood applications and in different materials. Definitely, it can make several tasks for one power tool.